Welcome to Tide Tables Restaurant and Marina. 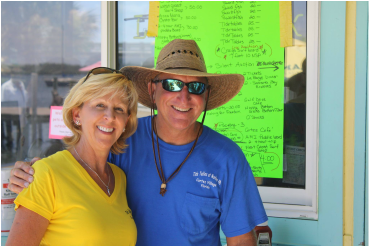 Owners Bobby & Gwen Woodson and Karen Bell invite you to sit back, relax, and enjoy our delicious local seafood and other fare served by our courteous and efficient staff. All the while, please take in our breathtaking views of the Intracoastal Waterway, abundant sea and bird life, big Florida sky, and the authentic working waterfront of historic Cortez Village. We named our new restaurant Tide Tables in tribute to the unbreakable bond between the rhythm of tides and the commercial waterman’s way of life in this true piece of disappearing “Old Florida.” Cortez was settled in the 1880s and now is the last working commercial fishing village on Florida’s Gulf coast and a designated National Historic District. One glance around and you will see this history in our array of antique fishing electronics, gear, and other equipment that is part and parcel to the proud traditions of Cortez life. One look westward from our outdoor deck and you will see why this indeed is a special place: be it the orange glow of a Gulf sunset, a flock of pelicans paddling at our docks, the roll of dolphin or manatee, the call of an Osprey, the passing vessels in the channel, or the exciting action at our docks as the charter boats arrive with their daily catch. We take great pride in bringing you only the freshest of seafood that Cortez has to offer -- often cleaned right here at our docks. It is prepared with skill, creativity and care by our chefs and brought to your table with a smile by our professional wait staff. We also offer a handpicked selection of beer, wine, and other refreshing beverages, along with delicious appetizers, daily soups, salads, specials, and scrumptious desserts.